Listening to Björk's MOMA exhibition through 49 B&W speakers | What Hi-Fi? 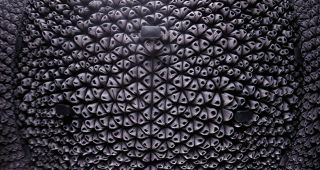 B&W has teamed-up with Björk to build a 49-speaker 3D sound system as part of the Björk retrospective at the Museum of Modern Art in New York. The exhibition runs from March 8th to June 7th and we were part of a small group of journalists to experience the Black Lake '3D immersive sound installation' at the studio in south London where it was meticulously designed - the first time it's been heard outside of MOMA. The Black Lake experience is built around the track of the same name from Björk's latest album, Vulnicura, and features a specially-designed 3D soundtrack built for the 49-speaker sound system, and accompanied by a 10-minute video. This is part of a wider Björk exhibition at MOMA, which covers the artist's 20-year career and features music, videos, costumes and more, and also has a B&W P5-powered audio tour. The Black Lake project has been put together by Marco Perry, a 3D sound designer, engineer and producer who now specialises in spatial sound production at Immersive Audio, following a lengthy career working with the likes of Depeche Mode, The Kinks and Van Morrison. Designed in a studio in south London with input from Björk and kit from Bowers & Wilkins, the result is a "spatial audio wave field synthesis" built using a Barco IOSONO audio processor. As Perry explains: "This is object-based audio as opposed to panned information from speaker-to-speaker, as found in conventional 5.1 systems. This is not loudspeaker specific. We create a soundfield, using speakers of course, and we inject images in to this soundfield. The speakers are told by the processor what soundfield to create." As well as wanting to push the technological boundaries, sound quality was paramount for Björk, as Perry recounts. "Björk came here and told me, 'I want to feel the sound, more than to hear it'. She wanted a lot of bass. We messed around, tried a few things, files were sent back and forth to Iceland... I think she's done a great job, the film is fantastic." B&W brand director, Danny Haikin, said Björk was "a huge lover of sound" and adamant (against the museum's wishes) that a hi-fi sound system rather than a conventional PA system was in place at MOMA, hence B&W's involvement. The MOMA system uses 49 B&W speakers, including CT800s, AM-1s and some monstrous subwoofers that were first used in the Bowers & Wilkins Sound System, which debuted at Primavera Sound 2014. The system is housed inside a 40 x 25-foot room in the museum, complete with screens and projectors for the video. We got the chance to listen to the replicated system in the studio in London, which uses three rings of 12 B&W AM-1 speakers - one ring at ground level, one at ear-level and one above the listener. There are then more speakers in the ceiling directly above the listener and a smattering of subwoofers. And how does it sound? Pretty damn immersive. In a relatively small room, surrounded by speakers, the initial impression is disorientating, almost unnerving, as you adapt to hearing music coming from all around you rather than from specific points in the room, as in a standard system. This feeling of disorientation fits well with the gloomy, uncomfortable story playing out on the screen - the song is based on the recent break-up of Björk's personal relationship. The surround sound effect is unlike anything you'd hear from a convential home cinema system or even a Dolby Atmos cinema - which uses similar technology - due to the number of speakers in a relatively compact space, and the accuracy of the sound programming. Once you adapt to standing in the middle of the performance - you're encouraged to walk around the room - the precision and detail of the sound really starts to impress, with drums rolling not just from left to right and front to back, but from the bottom of the room to the very top. The all-encompassing nature of the experience, with sounds appearing to fill every point in the room, is genuinely impressive and has us wondering about other potential uses, from DJs in clubs to live music performances. With Dolby Atmos and DTS:X breathing new life in to the home cinema market and reimagining what can be done with surround sound, this system is a brilliant example of what's possible. While the complete Björk MOMA exhibition has received rather mixed reviews, we'd definitely recommend checking it if you're in New York and have the chance, purely to experience the sound system in the Black Lake room. For everyone else, Björk will be bringing the installation to eight cities after the MOMA exhibition ends, including London and Paris. The exact cities and dates have yet to be officially confirmed. B&W will also be getting involved with four music festivals this year, including Primavera and WOMAD.